In 1962, Charlie R. Silver and Charles J. Silver founded Silver-Line Plastics with a vision: to build a successful business that would stand the rigors of time, focused on manufacturing the highest quality pipe and supplying the best service in the industry. For over 50 years, you, our valued business partners, along with our loyal employees, have helped us continue to pursue this vision for Silver-Line. Our customers’ ongoing support has allowed us to become an industry leader in innovation, quality, and service, and to become one of the industry’s most trusted employers. 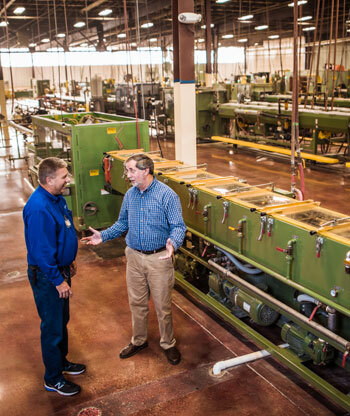 Today, we are manufacturing one of the industry’s broadest range of pipe products, including PVC, CPVC, Polyethylene & PEX at our state of the art production facilities in Asheville, North Carolina; Lawton, Oklahoma; and Ft. Pierce, Florida. From these facilities, we are marketing our products to a national audience of plumbing, irrigation, well casing, utility, and industrial wholesale distributors. We remain family-owned and operated, dedicated to the same core values and personal touch that made us successful upon our founding in 1962. We are committed to expanding our geographic marketing scope, adding new, innovative products to our existing product line, and providing you with the same quality PVC and Polyethylene products, supported with the same great Silver-Line service that you have grown accustomed to and trust.